A few weeks ago, I was so excited when Carrie gave me a jar of her preserved lemons. I was venturing into uncharted territory having never cooked with preserved lemons. I searched my cook books and the internet for interesting recipes. It seems preserved lemons are commonly used in South Asian and North African cuisine. 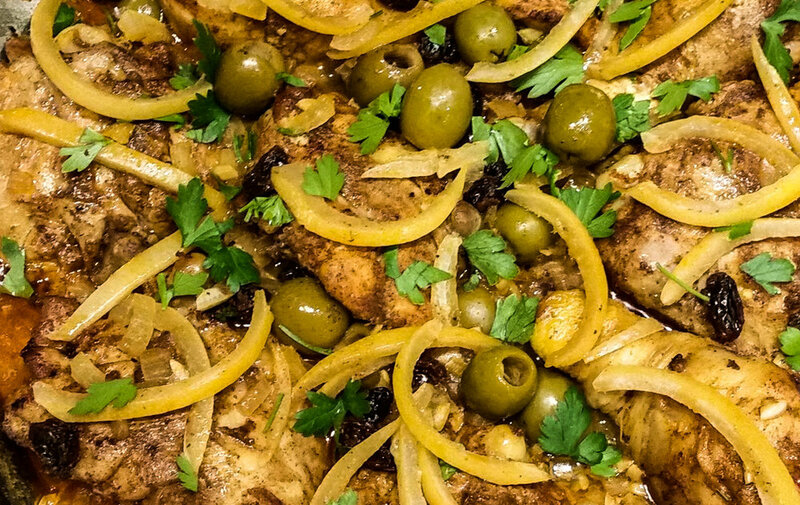 After trying a few recipes, my family and I decided that this one, Moroccan Chicken with Lemon and Olives, from Simply Recipes was hands down the winner! Not only was it delicious, but it was incredibly easy and, bonus - only uses 1 pan! Preserved lemon is a key ingredient in most Moroccan cuisine, especially tagine dishes. 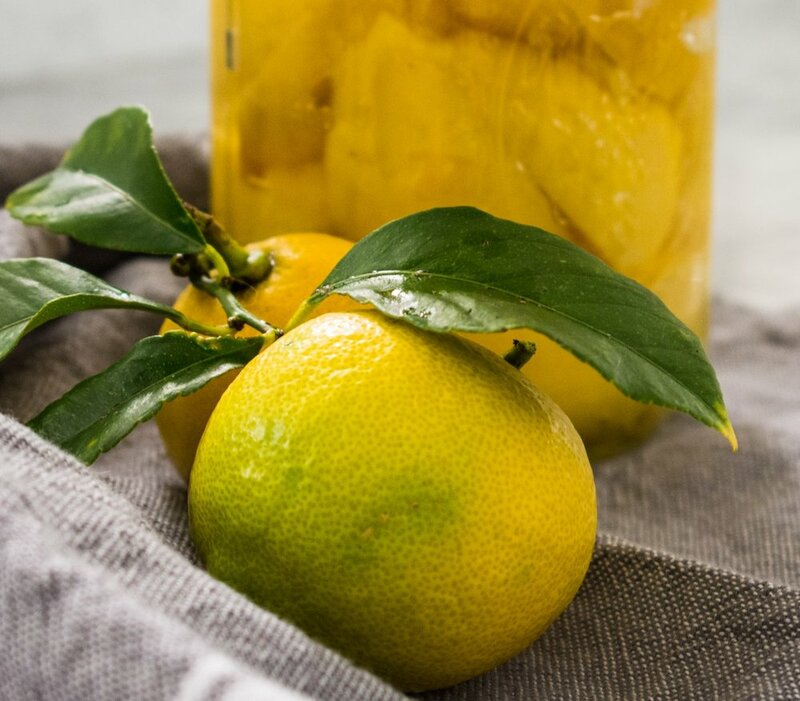 You can buy preserved lemons at specialty food shops, or better yet, check out Carrie’s recipe in this blog. A tagine is a clay cooking pot with a conical lid. I used my All-Clad Stainless-Steel All-In-One pan (which presented beautifully), since I don’t own a tagine, or you can use a cast iron skillet, but make sure to cover tightly with foil. So, for the sake of this recipe, instructions will be for a pan. This main dish has an interesting flavor combination from the warm earthy spices, briny green olives, tart slices of lemon and sweet raisins. The chicken was plump, moist and tender. A nice change up from our usual week-night chicken dinner fare. I hope you try this recipe, it truely is an intriguing dish that will awaken your taste buds! In a large bowl, combine all the spices – paprika, cumin, ginger, turmeric, cinnamon, black pepper. Pat dry chicken and put in the bowl, making sure to coat all the pieces with the spice mixture. Let chicken marinate in refrigerator for at least 1 hour (up to 4 hours). In a large heavy bottom pan heat olive oil on medium-high heat. Lightly sprinkle chicken with salt. The green olives and preserved lemons will provide a good amount of saltiness. Place chicken skin side down in pan and cook for 5 minutes, until skin is lightly brown. Do not over crowd pan. If necessary brown the chicken in 2 batches, returning all pieces skin side down back to pan before the next step. Lower the heat to medium-low, scatter the garlic and onions over the chicken. Cover and let cook for 15 minutes. Quarter preserved lemon. Rinsed in cold water, remove pulp and seeds. Cut rind into thin strips, then cut strips in half. Flip chicken pieces over. Add lemon slices, olives and raisins and 3/4 cup water. Bring to a simmer on medium heat, then lower heat to low, cover, and cook for an additional 30 minutes, until chicken is cooked through and tender. Mix in fresh parsley and cilantro right before serving.